Cheddar and Parmesan Crackers – One Half Indian. Another lovely weekend spent in Raleigh with family! Lots of good food was enjoyed. We had iddlies with coconut chutney for breakfast on Sunday, and for lunch on Saturday my husband made lauki kofta (it is a new favorite of mine, I will have to post a recipe later!). 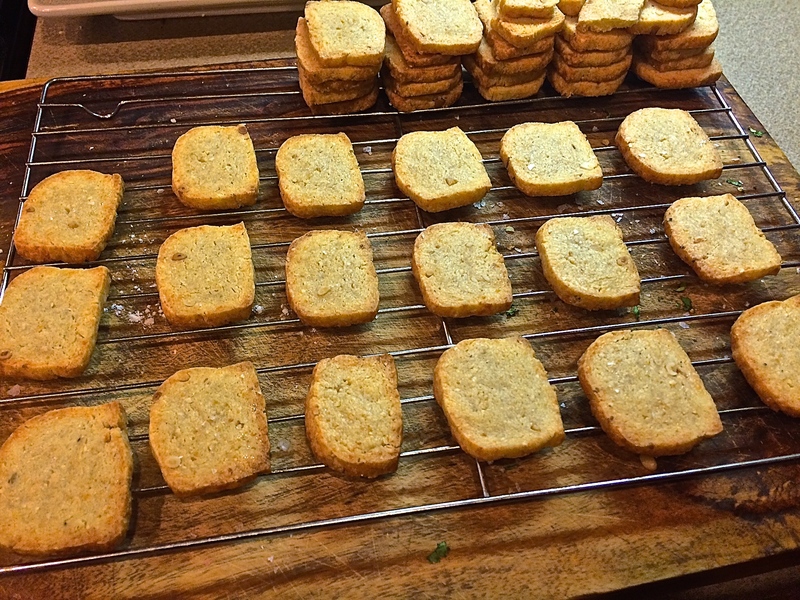 My sister-in-law wanted to make homemade crackers this weekend. 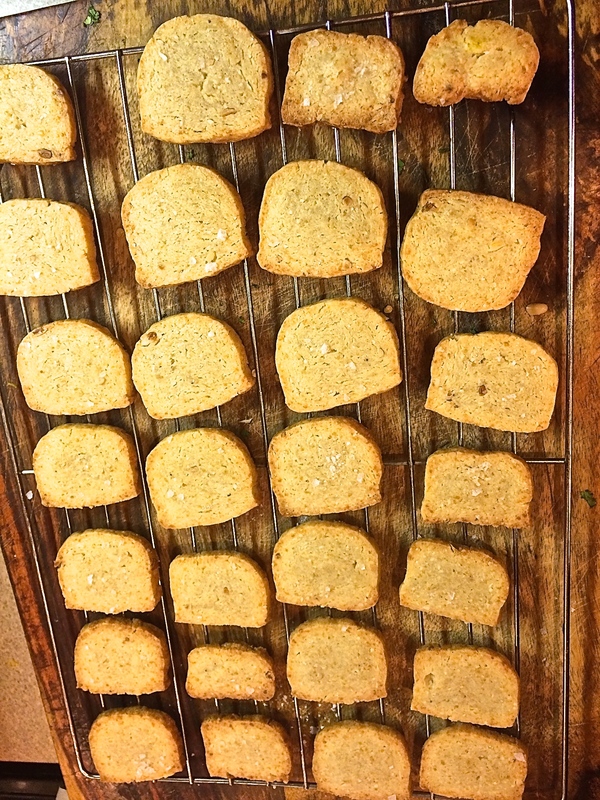 Neither of us had ever tried making homemade crackers, but we thought these turned out delicious. (Although in full disclosure, I have to admit that the nephew and husband did not like these.) I could not stop eating these cheesy, salty bites. I originally got the recipe from the Cookin’ Canuck food blog. I did adapt a few things because of what we had on hand and what seemed delicious to us. 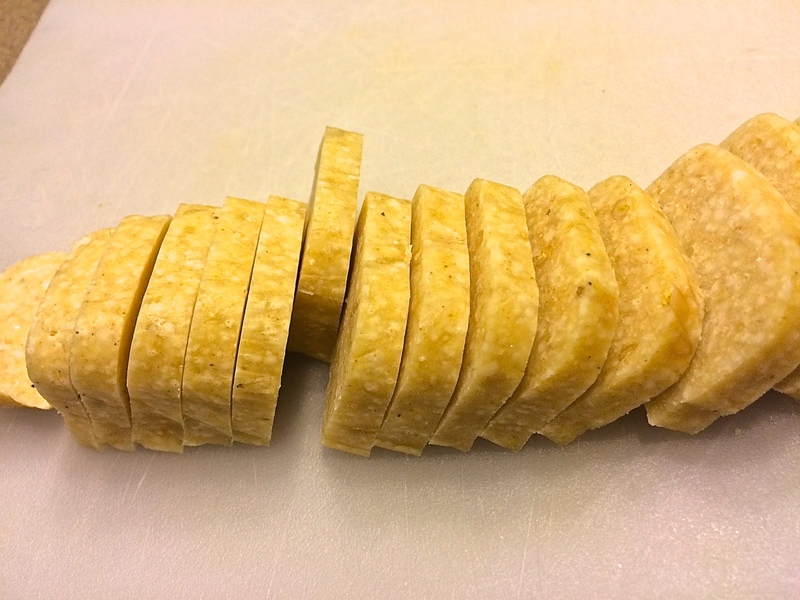 We subbed asiago for Parmesan; cashews for pine nutes; and adjusted seasonings. Use what you have on hand for this recipe. 1. In a food processor, combine flour, cheddar and Parmesan cheese, salt, and cayenne. Pulse just to combine. Add the butter and pulse until the mixture forms coarse crumbs. 2. In a small bowl, whisk the egg yolk and water together. Add yolk/water and the cashews to the food processor. Pulse until the crumbs begin to come together into a ball. 3. Turn the crumbs out onto an unfloured surface. Using the heel of your hand, firmly smear the dough away from you until the crumbs start to come together in a dough. 4. Using a pastry scraper or rubber spatula, fold 1/3 of the dough into the middle. Then, fold in the opposite 1/3 as if you are folding a letter. The dough will still be somewhat crumbly. Turn the dough 45 degrees, give it another firm smear, and form into a 14 inch log. We mad ours square, but I think round would be easier since you can roll it. I also think it may be easier to do two 7 inch logs rather than one big 14 incher. 5. Wrap your log well in plastic wrap and chill for 4 hours. 6. Preheat oven to 375 F. Line two baking sheets with parchment paper. Remove the dough from the fridge and cut into 1/4 inch slices. Place the cut pieces on the baking sheet about 1/2 inch apart. 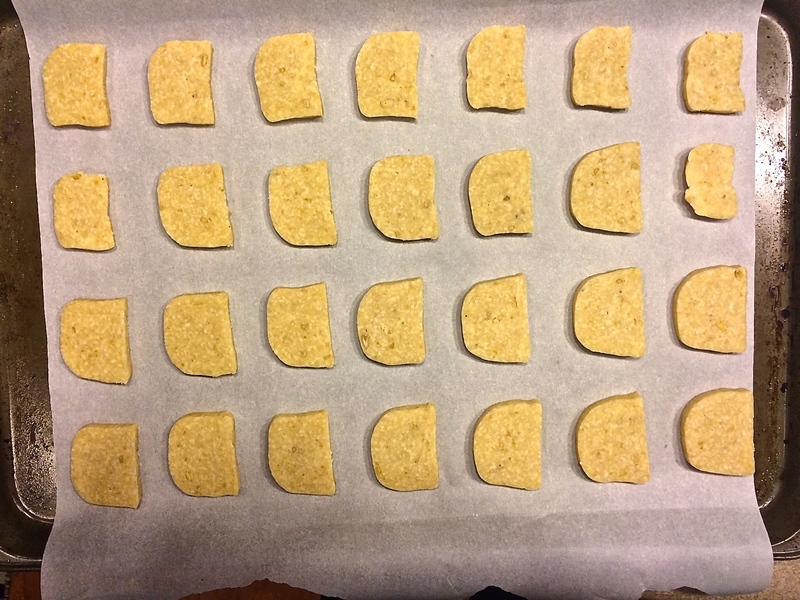 Bake the crackers until the edges are medium to deep golden brown, about 15-18 minutes. About half way through baking, switch the trays top to bottom and rotate back to front. 7. Immediately after removing from the oven, sprinkle with a tiny bit of sea salt. Move to wire racks to cool. Serve or store in an air tight container.